The Road ID is a great little innovation. 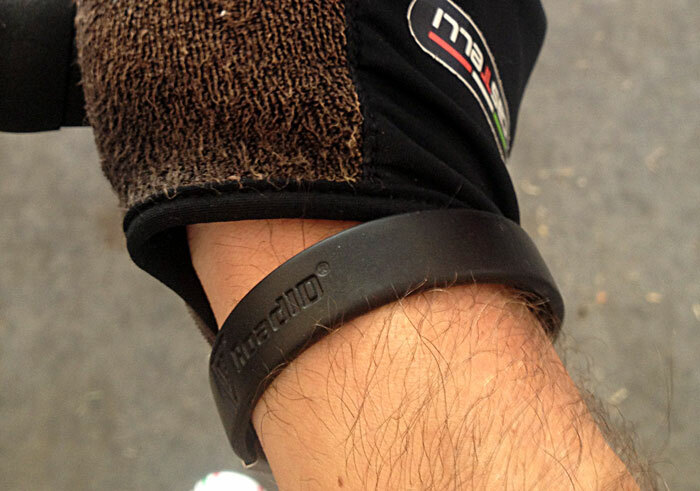 Wearable ID for athletes who do their thing in the company of motorized vehicles is a great idea. You never want to think about something bad happening while you’re out on the road, but you can’t help what other people do or how they act. If something does happen and you can’t speak for whatever reason, it’s nice to know that whoever finds you can have quick access to important info because it’s on your wrist. I sport the Road ID Wrist ID Slim. I dig it, because it resembles all those other trendy “cause” type rubber bracelets. Which means I can wear it all the time without looking odd. I look like everyone else who may or may not actually support a cause with a rubber bracelet. Also good, because I’m forgetful sometimes when it comes to hopping on the bike. I have been known to forget water bottles, pieces of clothing and — sadly — my house keys. Twice. So by keeping this bad boy on my wrist at all times, I know I’ll always have it with me. Another great feature is the numerous available colors and the ability to take your Road ID plate off and move it from bracelet to bracelet. I have a nice little system of when I wear what color. Being and alum of the great University of Central Arkansas, I of course purchased a purple band. I wear the band throughout the UCA football and basketball seasons. After basketball season wraps up for the Bears and Sugar Bears, I switch to my red band just in time for the NBA playoffs. I keep the red band on as long as my beloved Chicago Bulls are still playing. When the Bulls are ousted (far to early this season, unfortunately) I switch to black until it’s time for football season. The product offers a great piece of mind to me and my family and I like that I can have a little fun with it as well.